Two adult orphan brothers live an unusual life in a run down house. The older brother, Treat, is a petty thief and provides for the younger brother, Phillip. but deprives him of all knowledge, forcing him to live in a world of illiteracy and strange innocence. When Treat kidnaps a Chicago gangster, Harold, their lives take an unexpected turn as he turns the tables on the brothers but then educates them into the ways of the real world. Please register for the auditions and together with the part/s you would be interested in, and we will e-mail you the audition pieces ??thanks. 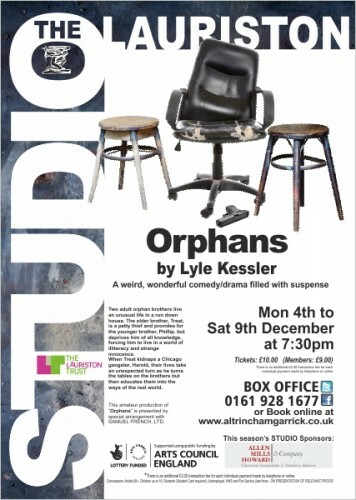 ?To register your interest please email admin@altrinchamgarrick.co.ukand put ?ORPHANS? ?as the subject. All parts currently open to Garrick members and non members. If you would like to have the latest Garrick News, especially audition updates from this website e-mailed to you directly, then please subscribe to our News ?blog? on the?front page? and be sure of not missing any of our latest announcements ? or maybe join our?Facebook?or?Twitter?pages as well. For more information about these auditions with a full list of parts – please see our website.